Brazil is a South American country sharing borders with all South American countries expect Ecuador and Chile. It is the largest country in Latin America and fifth largest in the world after Russia, USA, Canada and China covering an area of 8,514,876.599 km2. Brazil is considered an economic giant of the Latin America with oil a late development as an economic booster. This research paper indentifies Brazil’s current status in terms of economy, social and political stability. Statistical data and characteristic of changes would be a consideration to determine what challenges would emerge, be done away with and/or be managed for the growth of Brazil. Given Brazil boasts economic prowess in Latin America, a number of challenges and difficulties face the country currently. 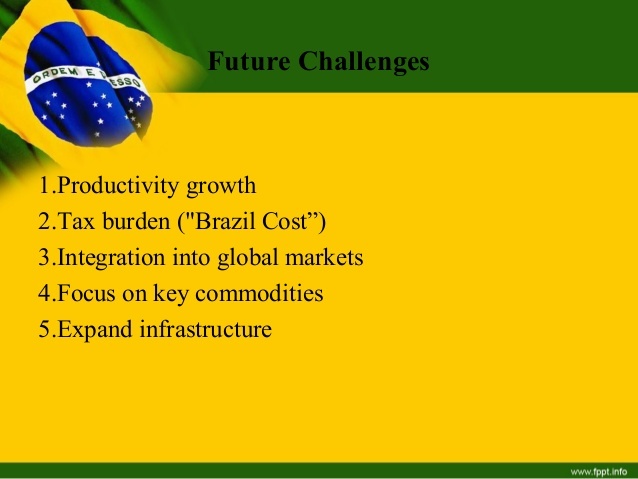 The future of Brazil is and will be faced by a number of economical, social, and political challenges. Brazil being one of the richest countries of the world makes up a record in the rankings of inequality in wealth distribution. The rich and the poor are not separated by status only, the digits of their income ranges and distribution of the countries income sets the boundaries. As a matter of reduction of poverty, some schemes and projects aimed at addressing the issue of poverty have been put in place. The efforts by President Luiz Inaicio Lula da Silva in the year 2003 did not bear as much fruit as it would have been anticipated it would. The projects were erected to address the issues of the most impoverished population of Brazil. To facilitate this, the president decided that the poor were to be given money directly to address their social factors. Crime rate in Brazil is a major challenge that faces current and threatens future social stability. Almost 24 cases of homicide are reported with every 100, 000 residents. Among other sorts of crime, muggings, robberies, kidnappings and gang violence are reported to be in the increase. The arm of the law is also involved in this sector of crime, where police brutality and corruption is a main issue. For the future of Brazil, with the daily increase of crimes corruption and brutality of police will not end soon. The consequence of this is that social are related aspects of Brazil will not be nearing stability any time soon. Education in Brazil is constitutionally overlooked by municipalities or the states. Going by this setting, the states under the evidence of economic disparities have varying financial strengths. Students from poor states get poor education while those from rich states get quality education. Concerning the development of the country in other sectors like economy, the poorly educated population contributes the list revenue to the country’s GDP. Other factors affecting the education in Brazil include non-attendance by absence and malnutrition. The case of absence from class is caused mainly by the challenges facing the poor that drives most of the student’s from the poor families to child labor. Although forbidden by law, child labor in Brazil is a common practice. The economy of Brazil is rather very stable as from the beginning of the 21st century. The factors that led to this kind of economy are associated with the availability of favorable climatic conditions that have pushed the major player of the economy, Agriculture, to maximum yields. The availability of ready local and international markets has been other factors that have pushed the economy so high. With the involvement in offshore oil drilling, the economy has been stabilized further. The challenges that are unavoidable that Brazil will have to face are centered in the factor of diminishing resources and the obvious threat posed by global warming. The oil reserves that Brazil drills will get exhausted; people opting for alternative energy may also take away the economic benefits acquired from oil. The could be a number of alternatives that Brazil can put in place to address the issue of if the wells or oil demand goes down, but going by the numbers and the facts on how beneficial oil is, the future in economical terms would face a major blow. Agriculture depends entirely on climate. Global warming in the other affects all climatic zones. This fact is a negative challenge that poses a potential threat to Brazil’s agricultural sector. With agriculture out as an economic contributor, Brazil’s future will be hanging on the balance unless a number of alternatives are devised before then. Brazil enjoys favorable political climate as of now. This is due to the stable governance that is in place. However, emerging issues threaten the future of Brazil. Some of the emerging issues that may present themselves have the potential to take the country in political wrangles and in a broad score to international or regional war. Brazil is in dispute with Uruguay for some border sections namely: Arroio Invernada and Brazilian island at the confluence of Quarai River and the Uruguay River. The dispute hasn’t been resolved diplomatically for some time. With chance of governments on both sides, the issue can be settled or lead to war. In that sense, the political future is faced by a challenge of possible war going by the history of war causing elements. Poor education, high crime rate, brutality and corruption by law enforcement units are major current and future challenges facing Brazil. The connection of poor education in some proportion of the population, and the possibility of decreasing economy boosting resources by exhaustion and global warming; broaden the future economic challenges’ margin. Outstanding political issues against international borders bears the highest challenge of possible war, political unrest, international relations within whose negative implication may be cut of trade agreements and diplomatic travel bans.